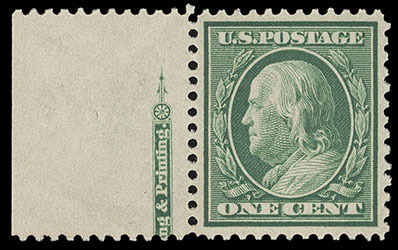 1909, 1¢ green, bluish paper, left margin single with part imprint, o.g., never hinged, exceptional centering and beautifully balanced margins, rich bright color on distinctively bluish paper, Extremely Fine to Superb, a difficult issue to obtain so choice, this being one of seven examples to receive this grade with only six higher; with 2013 P.S.E. certificate Graded (XF-Sup 95, SMQ $1,100). 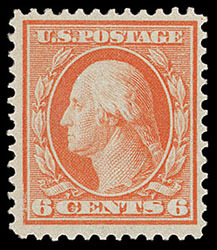 1909, 6¢ red orange, bluish paper, o.g., very lightly hinged, brilliant color on bright blue tinted paper, attractive centering amid wide margins, Very Fine; with 1975 P.F. certificate. 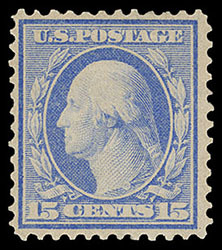 1909, 15¢ pale ultramarine, bluish paper, o.g., lightly hinged, strong bright color on distinctively blued paper, F.-V.F. 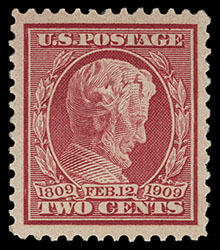 1909, 2¢ Lincoln, bluish paper, o.g., lightly hinged, precision centering amid large beautifully balanced margins, strong bright color and very fresh, small natural paper inclusion, Superb, a wonderful gem.